(CNN) -Mitt Romney's campaign announced Thursday that they're giving select supporters a chance to fly with the Republican presidential nominee on the candidate's charter plane dubbed "Hair Force One" by Ann Romney. Mrs. Romney coined the term "Hair Force One" in December to honor her husband's famously coiffed mane. In an email to supporters, Romney told contributors that two lucky donors would get chance to join him on his campaign plane for a day. The campaign does not specify exactly when the donors would be chosen or get to fly with the candidate. "I don't know exactly what our itinerary will be, but if you're one of the winners - I can tell you it will be exciting," said Romney in the email. "And, who knows, maybe you and I will come up with a better name for the campaign plane." 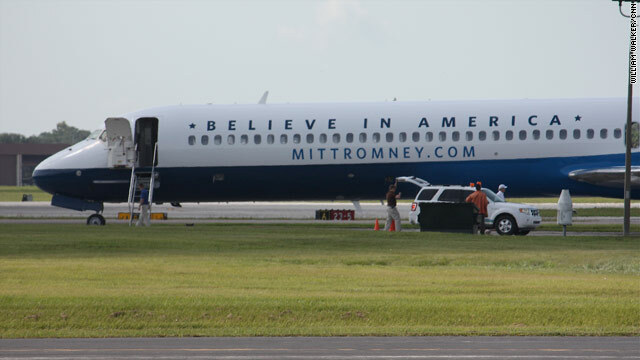 Romney's official campaign plane was unveiled at a rally in Lakeland, Florida following the Republican National Convention last month. CNN's Dana Davidsen and Rachel Streitfeld contributed to this report. Who ever gives one dollar, he should give two strings of his hair from his head. Woo hoo! A ride in an aeroplane, excuse me, aircraft. How thrilling for the common folks. I can pIcture the hours of fun as you are herded into the corner and the thrill of having the great one say hello to you as he passes by. presidential nominee on the candidate's charter plane dubbed "Hair Force One" by Ann Romney. Romney has a nerve to fly around in a plane that says "believe in America" while he's hiding his money overseas, won't show the people his tax returns, won't tell us his plans for the country and finally, attacked the President in the time of crisis when the country should be showing solidarity. I can't stand this guy! Just more proof that these folks are so divorced from reality that it isn't funny anymore. "Hair Force Once"....hardy har har! That's funny ....even funnier, think about it the slogan written on the plane . The Robme/ayn Lyin Ryan campaign only believes in the All White Rich side of America. If you're not in this club, you're not part of america and not part is this country as far as Robme/the Liar are concerned.